Theme based on the Twitter Bootstrap CSS framework. Using this theme, various widgets provided by the library are rendered using markup that is compatible with Twitter Bootstrap. The bootstrap theme is also extended with a proper (compatible) styling of widgets for which bootstrap does not provide styling (table views, tree views, sliders, etc...). By default, the theme will use CSS resources that are shipped together with the Wt distribution, but since the Twitter Bootstrap CSS API is a popular API for custom themes, you can easily replace the CSS with custom-built CSS (by reimplementing styleSheets()). Returns whether responsive features are enabled. Enables form-control on all applicable form widgets. This is relevant only for bootstrap 3. By applying "form-control" on form widgets, they will become block level elements that take the size of the parent (which is in bootstrap's philosphy a grid layout). Responsive features can be enabled only at application startup. 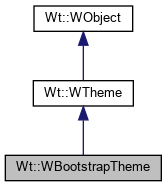 For bootstrap 3, you need to use the progressive bootstrap feature of Wt (see see 10.2 General application settings (wt_config.xml)) as it requires setting HTML meta flags. Responsive features are disabled by default. The default bootstrap version is 2 (but this may change in the future and thus we recommend setting the version). Since Twitter Bootstrap breaks its API with a major version change, the version has a big impact on how how the markup is done for various widgets. Note that the two Bootstrap versions have a different license: Apache 2.0 for Bootstrap version 2.2.2, and MIT for version 3.1. See these licenses for details.